spencer locke Photos, News, and Videos | Just Jared Jr.
Who Plays Nolan Hotchkiss on 'The Perfectionists'? Meet Chris Mason! Chris Mason is about to be the new hot guy you love to hate on The Perfectionists. The 28-year-old actor plays Nolan Hotchkiss on the new series, debuting tonight, and as we learned from this promo, his character totally had it coming. You’ve probably seen Chris before, but just can’t place him, right? Well, he was in BBC’s Broadchurch with Oscar winner Olivia Colman, and also starred in Legend and Vampire Academy, too. Most recently, you probably noticed him in The Honor List, opposite Sasha Pieterse. 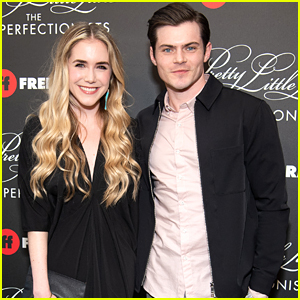 Chris is married to actress Spencer Locke, and they’ve been stealing our hearts for years with their cute Instagrams and never-ending support of each other. They met on the set of their movie, Mad Genius. Just recently, Chris shared a cute message to Spencer about her Netflix film, Walk. Ride. Rodeo. “So PROUD!! My talented wife at tonight’s screening for Walk Ride Rodeo,” he captioned with a pic on his Instagram. Tune into watch Chris as Nolan on The Perfectionists, TONIGHT, March 20th @ 8PM ET/PT on Freeform. Spencer Locke gets a lift from Max Ehrich in the trailer for their new movie, Walk. Ride. Rodeo. The upcoming movie is inspired by the true story of Amberley Snyder, played by Spencer in the movie, whose dreams of a college scholarship and pro rodeo career are brought to a halt when she’s involved in a devastating accident. The cast also includes Corbin Bleu, Bailey Chase, Alyvia Alyn Lind, Kathleen Rose Perkins, Sherri Shepherd and Missi Pyle. Walk. Ride. Rodeo. will premiere on March 8th on Netflix. 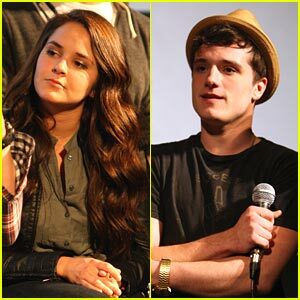 Josh Hutcherson is fedora fresh as he attends the premiere of his flick, Detention, during the 2011 SXSW Film Festival in Austin, Texas over the weekend. The 18-year-old actor caught up with EW on the red carpet to chat about another movie he has his eye on — The Hunger Games! Josh also just recorded a new Straight, But Not Narrow PSA. Check it out below! Spencer Locke and Shanley Caswell are also pictured.